Hive: Be Careful, It Stings! Founded by Urs Heckmann many years ago, in 2001 to be more precise, u-he has undeniably garnered one of the most favorable reputations of any software maker on the Internet. This is due to many factors, including the personal attention and interaction of the founder with his clients — a stark difference from the practices of certain software makers who only pay attention to their users' bank accounts. Nevertheless, u-he wouldn't be so successful in such a competitive market if it didn't make waves every time it releases a product. The fact that it started as a one-man show and it is now a multi-manned team proves that. Heckmann has gathered several developers around him, including Sascha Eversmeier and Howard Scarr. Sascha ought to bring excellent memories to the oldest among you, given his involvement in the free but nevertheless very good digitalfishphones plug-ins. For his part, Howard shouldn't be a stranger to film, music and sound design fans: He has been responsible for many Access Virus presets and has programmed sounds for Hans Zimmer for films like The Dark Night and Inception. Incidentally, his work on the Batman film led to the production of a special version of Zebra and a dedicated library, The Dark Zebra/ZebraHZ. Regardless of whether it's with effects like Uhbik, Satin and Presswerk or synths like Ace, Zebra and Diva, the software maker always offers original solutions and approaches. Products from u-he invariably sound very good (sometimes at the price of a high CPU load) and the underlying complexity is, most of the time, imperceivable thanks to the great efforts put into the usability and GUI (Heckmann used to be an industrial designer, which is easy to tell). Hence, you can't simply turn a blind eye when u-he announces a new product and highlights its ease of use, low CPU load and fat sound. Let's take a look. 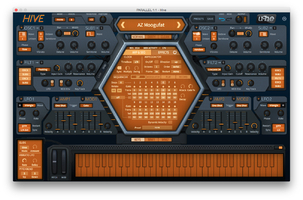 The software synth is available from the u-he site for $149 (+ VAT in the EU). It is Windows (XP, Vista, 7, and 8) and Mac (OS 10.5 and later) compatible. There are 32 and 64 bit versions in AU, VST2 and AAX (Pro Tools 10 or later) format. There's no standalone version, something we already criticized about Diva. The installation and authorization is a breeze, you only need a username and a serial number which you get with your purchase. This allows you to install it on several computers without the need of a USB key or challenge/response procedures limited to a given number of units. In this case, "several" refers to an unlimited number of computers, both Mac and PC. It would be nice for all plug-in makers to be that generous. 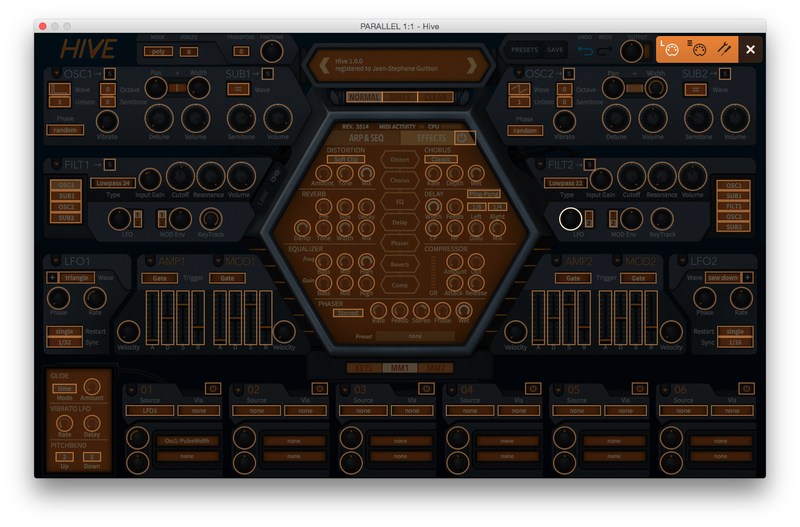 With Hive, u-he went for simplicity (but not simplification), usability and sound. You won't have to deal with multiple windows or numerous submenus, only a switch to toggle between the keyboard interface and two modulation sections, and the central display that switches from Arp & Seq to Effects mode. Everything else is right in front of your eyes and easily accessible with the mouse (or a controller; MIDI Learn is pretty fast and easy to use via the cogwheel in the upper right corner). 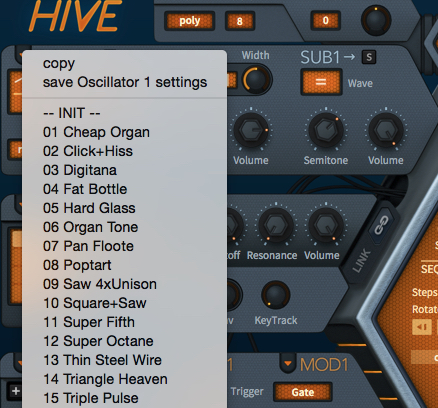 Hive can work in several modes: Poly, Mono, Legato, or Duo (priority to low notes) and it offers up to 16 voices of polyphony. 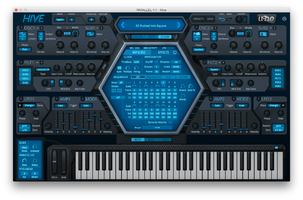 The synth is mirrored left and right of the central display, with two sound production signal paths. Each of them starts with an oscillator (what else?) that includes several waveforms: The four basic ones plus Pulse, Half and Narrow (two fixed square waves), as well as two types of noise (White and Pink). You can also find the usual (coarse and fine) tuning, Phase mode (random, forced reset and continuous), Unison (up to 16 voices), detuning, and Volume parameters. Less common are the Pan parameter (and its Width control), the Suboscillator and the Vibrato, made up of a pre-assigned LFO, common to both oscillators and suboscillators and whose Rate and Delay are adjustable via the dedicated keypad in the lower left side (max speed is 32 Hz, so FM is not possible). The Suboscillator features as many waveforms as the main oscillator (and with the possibility to mirror the waveform of the main osc), with tuning (by semitone) and Volume parameters. The good news is that the Pulse wave can be modulated (statically via the Constant function, or dynamically with an LFO or another modulator; I'll come back to this later), both on the main oscillator and suboscillator. 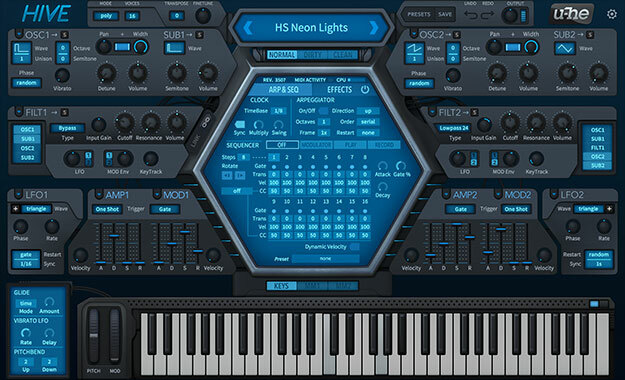 There are also some very practical features like a Solo button for the oscillator and suboscillator, and a menu with oscillator settings corresponding to typical waveforms, instruments or iconic sounds. This type of menu is present on all modules, making it easier and faster to dial in a dynamic generator (envelope) or an LFO, for instance. Next is the Filter, obviously. It's multimode, multislope and provides three different options (called Synth Engines by the software maker): Normal, Dirty and Clean. 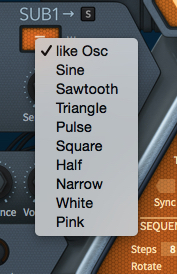 We are talking about three types of filters here, which have a direct impact on the rest of the synth. Normal is a self-oscillating ladder filter with a non-linear resonance (a typical Moog-like filter). Dirty is a self-oscillating diode filter (think MS20). Clean is a linear state-variable filter and it's non-distorting, so it's the less resource-intensive of the three. 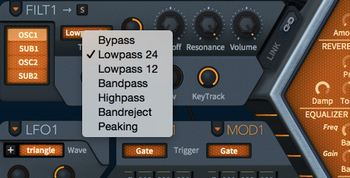 Here you have an example of a simple sawtooth filter in LowPass 24 (dB/oct.) mode, with all three filter modes one after the other (in the order above) and Input Gain variations. You can clearly hear the different possibilities provided by each Synth Engine, from a subtle filtering to nice sonic destruction (the Clean Synth Engine sounds softer, its resonance being much more violent than that of the rest). The design of the filter allows you to independently route the two sources of the signal path, as well as those of the other signal path. In plain English, Osc1 and SubOsc1 can go into Filt1, but so can Osc2 and SubOsc2, and vice versa. It's easy to imagine the harmonic timbral richness that can result from this. Other amenities include an input gain (ideal to observe the difference between the three Modes), an output Volume, a progressive KeyTrack, LFO action rate, and envelope generator modulation (you can use it indistinctly on the first or second signal path). And don't forget the Link button, which applies the settings of the first signal path to the second one, taking into account the relative positions of the buttons. One last surprise is that the output of filter 1 can be sent into filter 2. Nice! To finish with the basic modules (the global amplification level can be set with a single Output knob), we have the LFO. It features Phase and Rate controls, several restart options for the phase (Sync, Single, Gate, and Random), Unipolar and Bipolar modes via the "+" button, different rate values (in rhythmic divisions or duration), and eight waveforms. As for the very classic dynamic waveform generators (with four ADSR segments), one is assigned to the amp and the other one to the filter (both can also be found on the matrix). Each has its own sensitivity and velocity controls. The two generators are quite fast and it's very easy to reproduce those nice clicks that are so appreciated in analog. The cherry on the cake is that the triggering mode of the generators can vary: Gate, One Shot, LFO1 and LFO2 allow you to use them in a traditional way, or you can retrigger the envelope from one of the LFOs. Sweet! Remember that everything I just described is multiplied by two. The last movement generator, the modulation matrix, is accessible via the MM1 and MM2 buttons. There are 12 slots in total. Each of them allows you to choose a Source (internal modules, MIDI controllers, functions) and two targets with bipolar rates. The principle to choose targets was adopted from Zebra, whereby a crosshair appears once you click on the target selector so you can aim it at anything you want. Furthermore, you also have the possibility to add another modulator (with the Via function) from a list identical to that of the Source. Every Slot has its own Bypass button and a very practical pre-assignation menu. As I said before, it's simple but not simplistic. 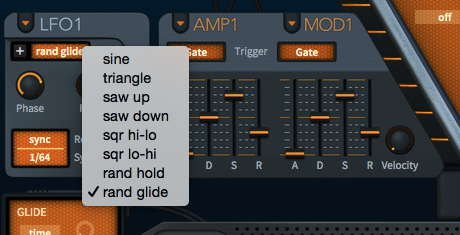 Right in the middle of the synth is the Effects section, which allows you to daisy-chain up to seven effects in any order you want (plus they can be enabled or disabled individually). You have distortion, delay, chorus, phaser, EQ, reverb, and compressor at your disposal. The Effects section can be deactivated globally. Effect parameters were voluntarily reduced to the minimum, but needless to say, they sound gorgeous (you can tell these guys know what they are doing), even if it would've been nice to be able to use a separate, more powerful distortion or reverb. Nonetheless, it's very useful to have all these effects available internally, which once again makes me moan about not having a standalone version (even if there are currently lots of pretty light hosting options out there). To open the section dedicated to the arpeggiator and sequencer you need to click on ARP & SEQ. First you have the clock options, common to both, with rhythmic division (quarter, eighth, sixteenth and thirty-second note), synchronization to the host tempo, and Swing and Multiply parameters (for dotted notes or triplets). 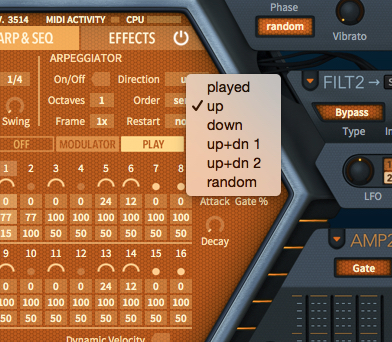 Next, the arpeggiator features several parameters: Direction (played "as is," up, down, up/down combinations, and random), Octaves (up to four), Frame (to slow down the arpeggiator), and Order (to define how the arpeggiator plays all notes before jumping octaves; it features four different modes). Finally, Restart allows you to specify the number of notes played before the arpeggiator jumps back to the beginning of the loop (with even and odd numbers ─ hooray! You can have a blast with polyrhythms). An excellent idea indeed. Once again, a pretty common tool but with that special add-on that makes it different. The same applies to the sequencer. It all starts with a set-by-step sequencer (with up to 16 steps) that features all the usual settings like Transposition and Velocity, articulation (with gaps or not: On, Tie, Rest), and three form parameters (Attack, Decay and Gate). 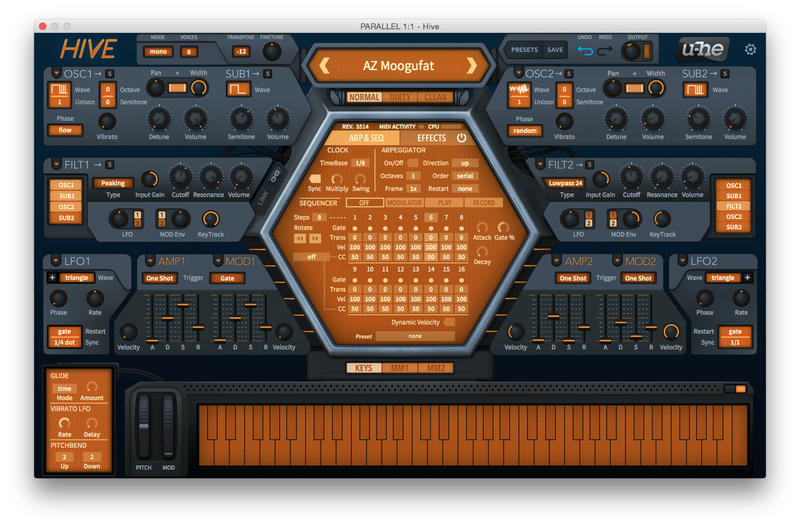 But there's also a Modulator mode that doesn't play notes, only the CC data contained in the corresponding row. Two Rotate buttons allow you to shift the entire sequence to change the starting point. When Dynamic Velocity is activated, the sequencer's velocity values are mixed with the actual velocity played. 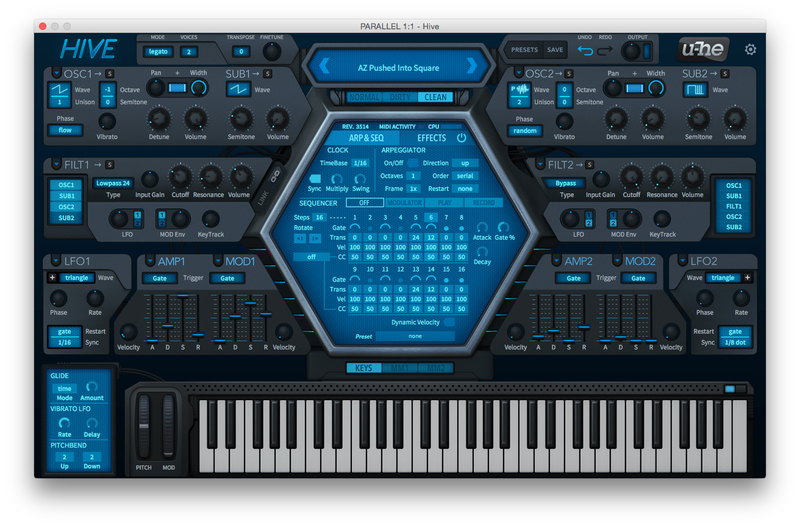 A small luxury is that you can reinput the steps of the sequencer (regarding notes) directly from the keyboard and the pitch and velocity are immediately recognized and assigned, like with some old units. You get the point. Okay, it's time to actually look at the sonic possibilities the software has to offer, based on presets, the creation or modification of preexisting settings, and always trying to benefit from the expressive possibilities that wheels, aftertouch and similar options can provide. Let's start with the basses, trying out round and acid sounds alternately, with lots of attack (or not), formant effects and a more than comfortable bottom end. There's something for everybody. Aggressive or, on the contrary, rounder leads, sometimes with well-achieved ducking effects. The MS20 or Moog filters work wonders. You can get standard sounds, but also more modern ones. The modulation matrix allows you to assign any controller to any target you wish, which guarantees the right expressiveness for whatever you want to play. 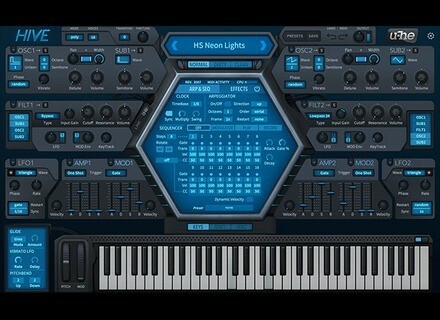 The pads in u-he's Diva really impressed me when I tried that synth out. And while Hive's pads don't have the same solid and slightly shifting feel to them, they are pretty good and offer very varied options. It's worth noting that the pads, like other sounds, make great use of the effects, unlike Diva, which can sometimes do without them. But even the most basic waveforms sound fine, which isn't something you can say about every synth. Let's now take a look at the different synths, pianos, stabs, plucks, etc. Again, the diversity of sounds is a real treat. It's sometimes hard to believe that the sounds are actually coming from the same unit (which certainly doesn't have to do with a lack of identity, because the software maker includes three different behaviors). Lastly, here are sequences and arpeggios, from classic to more unusual ones. Being able to create these types of sounds is yet another asset of the software. It's not easy to find defects when you review u-he products. The software maker shows a great consistency in the design of its software and the way in which it's implemented. This is true from both a technical and usability standpoint, and in relation to the content. The sound design and the presets included do a good job of illustrating the possibilities of the software. Hive's oscillators are very well-designed and they respond perfectly across the entire frequency spectrum. Besides, the suboscillators aren't just "simple" octaves. Their adjustability is not only unusual, but means that you end up with much more than a classic two-oscillator synth. The filters, while not equivalent to those of Diva, sound pretty good (Dirty sounds particularly delightful). The matrix is well-conceived (and very easy to use), just like the sequencer, which is a real treat to program, be it with the mouse or live. The effects give the perfect finishing touches to the sounds. They don't try to mask the deficiencies of the filters and oscillators, like is so often the case. And all of this with a CPU load that is much lighter than Diva. 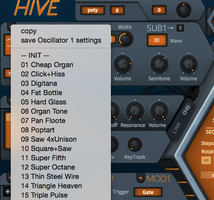 Hive immediately won a place in my live setup, replacing its bigger sibling, Diva, which can be way too demanding when you use other synths/hosts/effect at the same time. I do have two things to criticize about Hive: The lack of a standalone version is one, and the effect tails, which sometimes generate unmusical and somewhat loud artifacts when switching effects, is the other. If the standalone version is a not doable, at least u-he should tackle the second issue, because it can be really annoying. All in all, Hive is a great product. A true instrument capable of responding to the user's desires and nuances, regardless of whether he or she is looking for delicate or big, fat sounds. 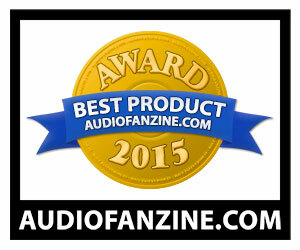 A well-accomplished mission that we've rewarded with a Best Product Award.